Gail Sibley writes a blog, How to Pastel. From her blog, "My love of pastel and the enjoyment I receive from teaching about pastel inspired the creation of this website. On it, I want to offer not only my own workshops both on- and off-line but also tips and reviews and opinions, and all manner of information regarding pastels, their use and pastels done through the years – old and new.The end of another month has rolled around and it’s time to inspire you with January’s Pastel Delights!" She writes about other pastel artists. "As always, the decisions were TOUGH, maybe even more so because of the 3/5 challenges being posted on various pastel Facebook groups over the past month. In case you are unfamiliar with this challenge, it means a nominated artist posts three paintings a day for five days. So you can see that there was even more work than normal to view and then choose from. I began with over 50 choices! Some got dropped because I didn’t have all the info necessary (that made it somewhat easier although there were a few choices I hated to lose!). Once I got the pool of images down to 20, it took me quite a bit of time, of rotating through the images again and again, to whittle the choice down to the mandatory 10 (it was almost 11 this time!). My choices are totally subjective. Some artists are well known, some emerging. I chose the pieces that made me look and look again, and that made some part of my being vibrate. So, enough talking, let’s get on with the show." Number one on her January list was our own Alain Picard! 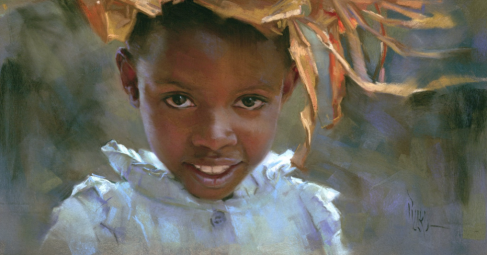 Gail writes, "I was absolutely charmed by this pastel of a young girl. I love the way Alain captured her sweet expression and the many colours in her skin. I also like his technique of blocking in the dress and the headdress (vegetation of some sort? makes me think of corn). The background is very simple and uses some of the colours from her skin and hair (purples and dark browns). Click here to see more of Alain’s work."